Does this leg have any hidden gates, involving Sicily, Malta, or any of the small islands near the finish? and we must go around the Corfou Island - Buoy 2. Also, the Finish line must be reached from its north access. Thanks, Toxcct!!! I was tentatively planning to go North of Sicily, and then I noticed Cvetan had placed a gate in the router to block that... so I figured something like the Sicily gate must be there. I guess I'll post something in the VR forum to raise the issue... 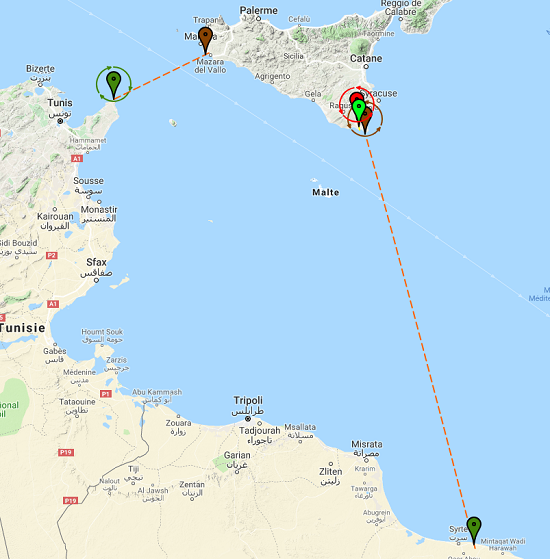 I think the routing is pretty much the same until we get past Algiers, and actually even to the southern end of Sardinia... so we have a couple of days before it hurts anything. But as it stands, that's going to upset some people... The "North of Sicily" route may wind up being faster, which will be a major problem for anyone who goes there and doesn't get the expected benefit. It reminds me of the race where something similar happened several months ago (Mini en Mai, I think). We figured something like this out here, and then VR changed the hidden gates to allow the other route... So let me recommend re-checking the Sicily gates in a day or two, if you don't mind. It looks like it is geologically impossible to sail the hidden Buoy 2 gates incorrectly. The hidden gates at the finish are interesting... As you indicated, the only real impact is that you cannot sail down the channel to the west of the finish and then come up from the south... But it would take some really strange wind for that to be desirable. The interesting part is further north... at "Lefkada" in your image. The first part of that passage has a "floating bridge"... in the game, it looks like you can sail through. But then further down that passage, near the town of Plagia, the game seems to have that channel closed. And that's funny because it's open in Google Earth. Hopefully it really is closed in the game... if it isn't, then that could turn into another place for problems... because the hidden gates don't allow that route. I just realized there's a buoy shown on Sicily. Was that always there, or did they add it? If it was alway there, I feel stupid for suggesting there was potential for confusion. I thought Buoy 1 was at Corfou yesterday... that's why I raised the question. But maybe I just got confused because Cvetan's first "go to" option was Corfou. Always been there. It was not in the routing initially because at first the forecast was South of Sicily anyway, but I noticed that the routing had changed and added it. Could we now, trust the WP ? 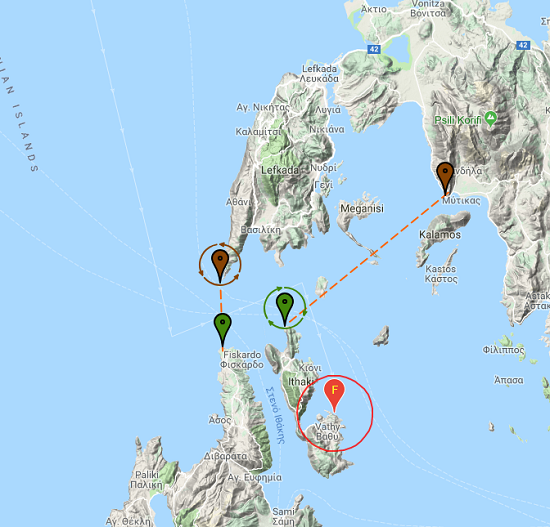 I am concerned for the passage after Corfu with multiple WP close together. Yup, the buoys/gates are still the same as presented above.